A comfortable, fully detached holiday home with a lovely interior. Enjoy the gorgeous, completely enclosed garden, with a large lawn, swing and flowers. You have access to two terraces, one at the front of the house and one at the side of the house (covered). The wonderfully quaint Plaisance (500 m) offers a swimming pool, a recreational lake with plenty of beaches and areas for swimming, sailing, surfing, canoeing, kayaking, fishing and bike rental. Just 14 km away is the 13th century fortified town of Marciac, featuring a Jazz Museum and lovely church. 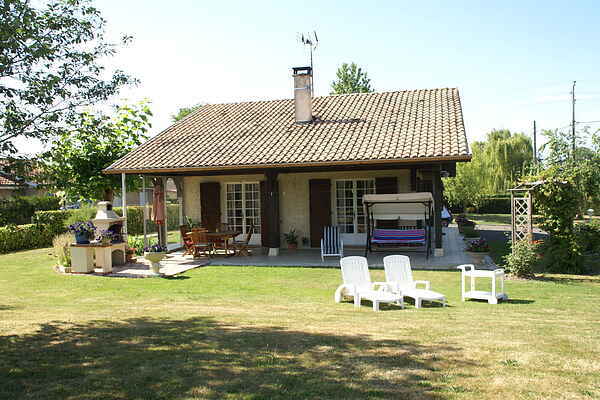 Marciac also offers a large recreational lake (jet-skiing, fishing) and a swimming pool. All kinds of shops such as a grocery store, a market, a tennis court, post office, bank, restaurants and cafes can be found in Plaisance (approximately 500m). Combine culture with fitness by climbing the 12th century tower in Termes d'Armagnac (10 km). And you simply cannot miss a visit to the Roman town of Auch (55 km), the capital of the Gers. The imposing cathedral, the Tower of Armagnac and the Jacobins Museum will certainly not disappoint you.